A Peer to Peer Lending (p2p lending) concept is growing rapidly in India. Peer to Peer lending is easier and faster way to lend and borrow loans. Let us say you are running out of money and you are in desperate need money for setting up a new business, medical expense, self-marriage, medical expense or anything else. What do you do? You generally talk to your friend or relative for the money or you approach a bank and take a personal loan – right? Well, what happens if both the options are not available to you? Don’t worry p2p lending platform may solve your problem. In this post, I will be discussing peer to peer lending in detail. What is Peer to Peer Lending – P2P Lending? Peer to Peer Lending is an easy, convenient and hassle-free method, where individual lender lends unsecured loan to a borrower at a suitable interest rate. In P2P lending people who need money connects with people who are willing to lend on online web based platform. Peer to Peer lending is alternate but reliable financing option for many individuals. This option is now available in India. Let’s try to understand how p2p lending works. Step -1 – You need to register on the p2p platform as borrower or lender. During registration, you need to provide personal, professional and financial information. Step-2 – P2P platform verifies the credibility of this information by checking documentary proof. This is in line with KYC verification norms. Step-3- Once verification is completed lender or borrower can publish their listing on the site mentioning information like the purpose of the loan, interest rate etc. Step-4 – Borrower or lenders can contact each other. They can also see documentary proof before lending a loan. Step -5 – Loan tenure, a rate of interest and other terms and conditions are discussed between lender and borrower. Step-6 – On agreement of both lender and borrower disbursement of loan happens. During disbursement P2P platform plays an important role in making loan agreement and money transfer from lender to the borrower. What are the benefits of P2P? Lender or investor can use surplus money to lend and can generate extra income. Investor decide how much money he want to lend to borrower at what interest rate. P2P lending is easiest way to generate regular passive income for the investor. As investor can help someone in fulfilling their dream it is like leaving mark on someone’s life. Borrowing is easy and less time consuming. Fixed rate loan once rate is fixed with lender it will not change. No prepayment fees you can choose to fully pay your loan early, there won’t be a penalty fee for closure. What are drawbacks of P2P? As loan is unsecured if borrower default with nonpayment of EMI you can lose your money. It is easier for criminal to cheat an online lender by providing fake identities. How Peer to Peer Lending is different from Traditional banks? 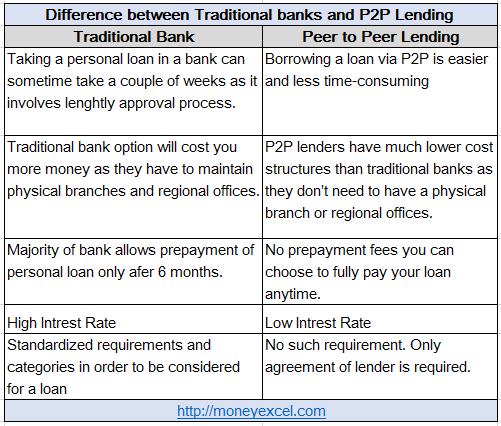 Difference between Traditional banks and Peer to Peer Lending is given below. 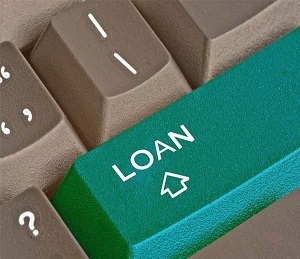 How I can avail P2P Loan? There are multiple P2P Loan lending companies in India. If you are seeking P2P loan you can log on to following websites. Should you use Peer to Peer lending? You can use Peer to Peer lending for borrowing money. It is a quick and easy way to get a loan. However, if you are lender please wait. At the initial instant, it looks very lucrative for lending money using P2P. However, there is a risk of unhealthy practice being adopted in this sector. It is unorganized sector without any regularization. You may end up making losses by lending money to the unknown person. Have you heard about P2P lending? Do you use P2P lending for lending or for your fund requirement? Feel free to post your query about P2P lending. I will be happy to answer it. « How Salaried Person can maximize tax saving? Thanks for mentioning Lendbox and explaining the whole process. Really appreciate.